Scotland’s chefs share the ingredients, flavours and trends we can expect to see more of this year. As people become more aware of the negative impact meat consumption can have on their health and the environment, veganism is edging further into the mainstream. More people than ever signed up for Veganuary in 2019 and plant-based dishes are becoming ubiquitous at dining venues throughout the country. 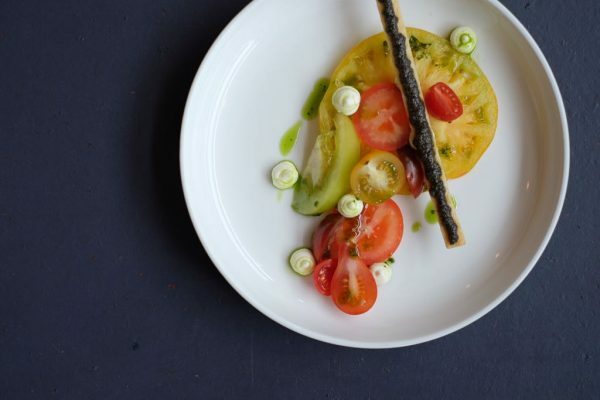 Scott Smith, chef patron at Edinburgh’s Fhior said, “Although it has already started in smaller pockets, I think less protein is going to prevail more on menus. I think we should be eating better quality meat and fish and less of it.” Smith believes we’ll see a rise in vegetable-led cooking with more stand-alone vegan restaurants opening in Edinburgh and beyond. While Indian and Chinese dishes have long been a staple of British diets, 2019 will see chefs experimenting with lesser-known, more authentic and lighter Asian ingredients as consumer awareness of global cuisines continues to grow. Stuart Ralston, who runs ingredient-driven restaurant Aizle in Edinburgh, comments: “The thing I’m most excited about at the moment is koji, the fungus species that Japanese chefs use to make sake or miso. We’ve been using it to help age our meat faster and it’s a really cool process which gives a great flavour.” Other Asian ingredients to look out for this year include shiso leafs, jackfruit and Szechuan peppercorns. 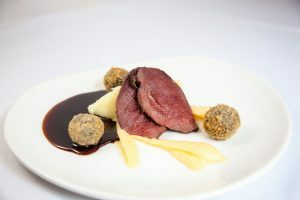 Wedgwood The Restaurant: Pigeon, haggis, neeps and tatties. 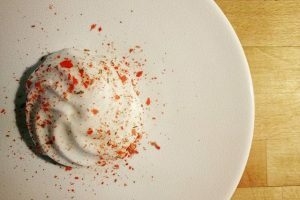 As well as recycling and reducing plastic, chefs are increasingly finding inventive ways to reuse their food scraps with processes such as fermentation or drying. Scott Smith says, “Utilising food waste is a nice creative challenge for our team. We dry peelings and blend them with salt to use in our cooking and we use whey to make caramel for desserts or a sweetener.” As well as aiding gut health, fermentation can help reduce wastage and preserve out-of-season ingredients and can be done with everything from vegetables to meat, fish and herbs. “If a supplier has a large yield of a particular seasonal product, we’ll use it fresh on the menu then preserve and ferment the rest so that when it’s not seasonal we can use it in preserves,” says Scott. For example, Scott uses wild garlic fresh in the spring and in the winter as a preserve, or fresh swede in winter then to brighten dishes as an acidic preserve in the springtime. From the streets of Bangkok to the supermarket shelves of the UK, insects look set to become one of the more controversial food trends this year. At the end of 2018 Sainsbury’s hit the headlines when they introduced Eat Grub’s Smoky BBQ Crunchy Roasted Crickets and Paul Wedgwood of Wedgwood the Restaurant believes more and more chefs will be adding creepy crawlies to their menus soon. “As chefs look to become more sustainable, it’s the next logical step,” he comments. 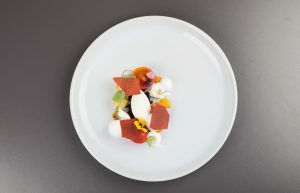 “I’ve eaten insects in Noma in Denmark, one of the world’s best restaurants. I also work closely with some foragers who are keen to push me down that route.” Deep fried, dried insects can be used as a seasoning to add a fresh, lemony flavour to a range of dishes, or if you’re after a trendy pre-dinner snack, why not offer your guests a crunchy cricket canape?